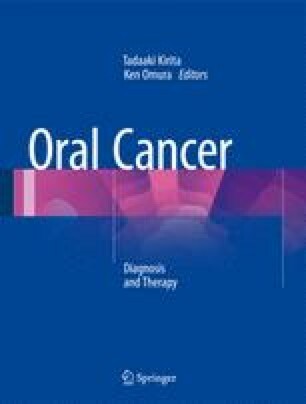 Regional nodal status is one of the most significant prognostic factors in patients with oral squamous cell carcinoma; therefore, diagnosis and treatment of cervical nodal disease is one of the most highly debated topics among head and neck surgeons. Imaging modalities currently available in clinical practice include ultrasonography, computed tomography, magnetic resonance imaging, and positron emission tomography. However, none of these methods can independently confirm occult metastasis. A patient’s risk of regional metastasis is determined through clinicopathological evaluation of the primary tumor. Elective management of the neck is warranted when the risk of occult metastasis is >20 %. In these situations, the modality of elective treatment is influenced by that selected to treat the primary tumor. When surgery is indicated, selective neck dissection (SND [I–III)] is generally required; however, SND (I–IV) is recommended for patients with tongue squamous cell carcinoma. Modified radical neck dissection is the gold standard for the N-positive neck; however, SND is applicable in selected patients. For patients with multiple node metastases or extracapsular spread, postoperative radiotherapy or chemoradiotherapy is recommended as soon as possible after surgery.